It was a rainy day here in Georgia yesterday and what better way to hunker down than with a warm bowl of soup. Luke and I spent most of the afternoon playing Legos while the little guy napped which made for a very relaxing day, but the moment I began sauteing the onions, garlic and pancetta for this pasta fagioli, the house came alive with a savory aroma! To the best of my knowledge, pasta fagioli, in the simplest terms, is an Italian soup made with pasta and beans. I've toyed around with a few recipes and I just really like the earthy flavor of this one. The combination of rosemary, thyme and bay leaf is pure perfection! 1. Wrap thyme, rosemary and bay leaf in cheesecloth and secure with kitchen twine. 2. In a large, heavy saucepan or Dutch oven, heat olive oil over medium heat. 3. Add onion, pancetta and garlic clove and cook for about 5 minutes. 4. REMOVE garlic clove and discard. 7. Season the soup with salt and pepper and serve with fresh graded Parmesan. I love soup! I've been looking for a new recipe for a while, looks like I found it. Thanks! This is one of my favorite soups! 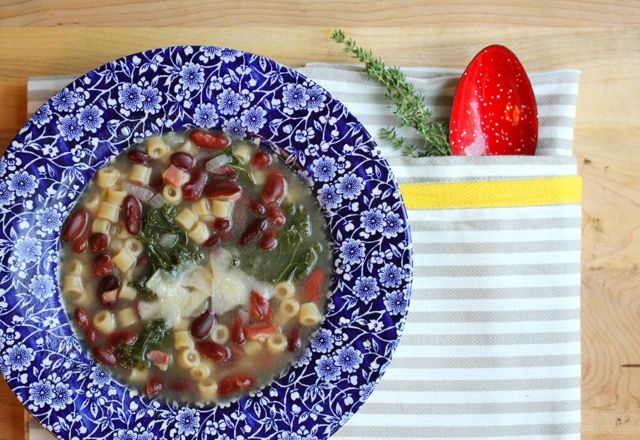 I heart pasta fagioli and this recipe and pic are amazing.